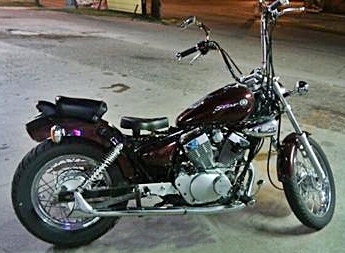 Changes Log – 2002 Virago 250 – Les S.
Due to family medical issues, I am no longer riding my motorcycle to work. My commute is 94 miles round trip, half on I-95 in traffic, half on 50 mph 2 lane roads, and is pretty dangerous compared to just riding it locally on the weekends. I have done 259 commutes by motorcycle – 20,026 miles – in the last 3.5 years. I started April 2010 and my last motorcycle commute was 9/20/13. In this commute, I have learned valuable lessons on how to stay alive on a motorcycle – these lessons have improved my driving safety in the car, also. I have been wearing an orange reflective vest for about 1 1/2 years. It is looking frayed from the wind and dirty from me using olive oil on the airfilter and it getting all over me – so I just replaced it. I got neon green this time – the green might get noticed more because it seems like police use light green vests in my area more than the other colors. With this vest I have moved up to “Ansi 2” – maybe I will be good enough for “Ansi 3″ next time. I have gotten 71.7 mpg for the last 650 miles on my 2002 Virago 250. Since I bought the bike used in April 2011, I have driven the bike 13,265 miles and my average is 83.2 mpg. For the month of May 2013, I got 78.5 mpg. For the same time period in 2012, I got 82.8 mpg. 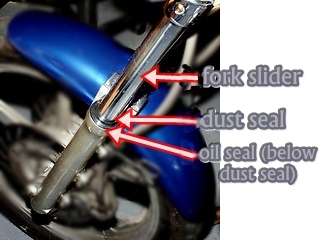 After this weekend I have a new appreciation of fork seal maintenance – you can do quite a bit the “easy way”- without removing the fork. Anybody can do this – even if you do not do your own work on your bike. First 17/38 commute – No rain for today, so I finally got to ride the bike to work for the first time with 17/38. As expected, it “moves up” the speed range for each gear. If you used to go 35 to 50 mph in 4th gear, for example, now you would go 40 to 55 mph. A lot of my commute is 50 mph and hilly, so I was in 4th gear a lot where I used to be in 5th gear. Fourth gear is more comfortable than before at 50 to 55 mph – 5th gear is less comfortable at 50 to 55 mph. Fifth does not climb hills as easily as before. So basically with 17/38 you stay in lower gears than before and use 5th more for highway use. In my opinion, 17/38 is the proper stock setup, and 17/40 is good if your carry a passenger, have heavy accessories, or your engine is not running at it’s best. It makes a great bike even better. Stock tire is 130 – if you have 17/38 and a 140 tire, when using rpm charts, your sprockets are equivalent to 17/37. This morning I95 in Connecticut was really moving – in traffic I ran 75 mph indicated (70 actual) for a few miles – that is 5,700 rpm which usually sounds revved-up but today it seemed comfortable. I hit 80 (75) a few times, which is 6,100 rpm. It would be easy to think that higher gearing (17/38) would result in slower acceleration – it does not, since you are usually in a lower gear. The weather was good enough yesterday for me to ride the bike to work, but I couldn’t because of my left arm (tendonitis). I think I could have done it OK going to work, but going home I have 20 miles of heavy I-95 traffic – using the clutch a lot might not be good. I not a fan of auto clutch or auto transmission bikes, but I could use one now. We are lucky that maybe 98% of bikes are manual transmission. With medium-sized and larger cars, it is getting harder to find. I took it for about 8 miles on I-95. BIG difference. In town I was staying in the lower gears longer, on the highway I was in 4th longer – I hit 65 mph indicated in 4th gear several times. Changing from 17/40 to 17/38 feels like a big difference – the change is 5.0% – sprocket changes have a bigger impact than the numbers say. My change was 5% and I felt a big difference. I can’t even imagine how it would feel to change from stock (16/45) to 17/38 – that is 20.5% ! A 3% weight reduction (net vehicle + driver) makes a noticeable difference in performance – acceleration, braking, hill climbing, and more pulling power at lower rpm in each gear. I have removed about 40 lbs from my bike – a 7.2% weight reduction. If I was 140 lbs instead of 215, the net weight reduction would be an additional 14.6%. (pass the vegetables, please). The 4 hour commute – I95 in southern Connecticut was a mess yesterday due to emergency road repairs. My 94 mile round trip commute took 4 hours instead of 2.7 to 3 hours. But I still got 75 mpg on my Yamaha Virago 250 – normal lately is about 80 mpg. 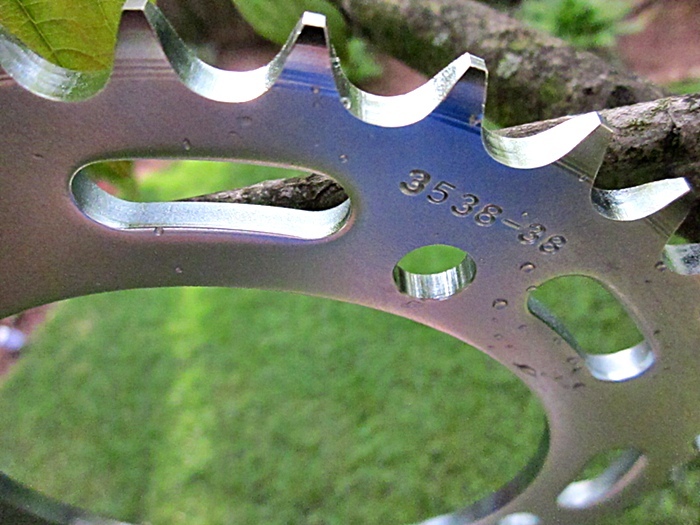 My 38 tooth rear sprocket should be in soon – so I will be going from 17/40 to 17/38 – a 5% change. At 5,000 rpm my indicated speed will go from 62.2 mph (17/40) to 65.5 mph (17/38). That does not sound like much – but sprocket changes have a bigger impact than the numbers say. When I went from 17/39 to 17/40 (2.5% change), I was surprised when I noticed a bigger difference than I expected. I am actually excited to see how it goes – and I don’t get excited too often. Today is the first time I have ridden the bike to work in two weeks – the rain has finally ended. There is no doubt now that it has more power due to the recent changes (reduced weight, set valves looser than spec, put in Sunoco, fixed spark plug wire, cleaned plug threads, reduced Supertrapp outlet opening size). I was using fifth more, running slower in all the gears, etc. The 38T rear sprocket is going to cost me $29 – I have been putting that off for over a month now. The 40T revs higher on the highway, but the exhaust change helps a little. The looser valves did not add any valve clatter noise. I can hear a small increase in “sputtering exhaust leak” noise, but it is probably due to the quieter exhaust. One of the “luxuries” my bike has is a thermometer. When I left to come home, it said 98° F (36.7° C) but the bike was parked in the sun. Driving home it was between 88° and 92° F (31° to 33°C). I was using an ice pack that I made, but it did not help very much – I need to make a better one…. I adjusted my 2002 Virago 250 valves today. My bike has 21,500 miles and there is good chance it had never been done – the prior owner did not mention valve adjustment. The timing mark cover was on way tight. Three valves were in spec and one was a little loose (it was .15 mm instead of .14 mm). For a little more performance and gas mileage, I set the valves a little looser than spec (intake .13mm, exhaust .15mm). I used the same 3mm wrench that I used to adjust my CB160 valves back in the old days. 3) ..The bike has been popping on decel and at cruise lately – today I found a spark plug wire was not pushed in all the way. Based on a short test ride, I think the popping problem is mostly fixed. 4) .. I changed my Supertrapp “bottom-facing slot” from two discs to one disc – the bike is much quieter now – hopefully my ears won’t be ringing as much from the 1.5 to 2 hour ride home from work. Maybe it will increase torque, too. edit May 26, 2013 – After a week of rain, I finally got to ride the bike today. It definitely felt faster and more responsive, plus the popping was gone. Recently I reduced the weight, set the valves looser, put in Sunoco, attached a spark plug wire better, and cleaned the plug threads (I have iridium plugs, the tips looked fine) – so I have no idea which change(s) made the difference. b) Later, I changed back to the Supertrapp endcap. I only used 4 rings and I removed 40% of the middle two rings to make a “bottom-facing slot” (so most of the noise will go downward away from the rider). c) Then I added a fishtail exhaust tip to the Supertrapp muffler. e) Today I changed to “bottom-facing slot” (one disc) – much quieter. I removed my tailbag, aero enclosure, rear seat (total 5.4 lbs) and replaced it with a plastic storage container (1.6 lbs) – for a weight reduction of 3.8 lbs. My old rear tailbag was camback for better aerodynamics (please see near the bottom of this post http://wp.me/p1LWaM-qh ) plus it was 14 inches high which helps the aero effect. My new rear storage is 8 inches tall and is not camback so my aerodynamics will not be as good but still better than not having rear storage at all. This is not for everyone, but, if you are trying to add storage on the cheap, plastic storage containers might be a good idea. If you get one of the dark colored ones and add some reflective tape, you might be able to make it look a little more like it was actually made for a bike. I will add more info later as I experiment with this and learn more. I think there should be about a two inch gap between the driver seat and the container, or a one inch gap and then trim the front handle (the one that hits you in the back). Last night I moved it back some, but this morning I saw that I need to move it back at least an inch or trim the front handle. It is 12.25 inches long x 9.25 inches wide x 6.5 high and holds 736 cubic inches or .43 cubic feet. I sometimes carry about 12 lbs in it. I changed the front handle into a “hinge” made of 2 thin bungee cords – if something “almosts” fits, the hinge stretches about an inch. You could leave the lid open (use extra bungee cords) and carry maybe 1200 cubic inches. I bolted the rear to the rear attachment point for the passenger seat (using a 3 inch x 7 inch piece of aluminum as a stiffener), and I drilled the front passenger seat bracket and put one bolt in that (for a stiffener I used a piece of plastic and a very thin piece of aluminum). The one I have must be discontinued, as it is not listed at any stores, but they have a bigger one – 16 x 10.75 x 7, 1204 cubic inches or .7 cubic feet. Sorry, no pictures yet – I have to get it looking better (I do have some pride). Weight Reduction – Recently I went to a 130 tire and removed the center stand and fishtail exhaust tip – for a total loss of 9 or 10 lbs – so including my rear storage change my total weight reduction is now 13 or 14 lbs. On my commute this morning, the bike definitely felt stronger – plus I quit taking that allergy medicine so I was doing the corners faster. I could remove another 5.3 lbs by going to a lithium battery – but the cost of around $100 does not work with my “low-budget functional” theme for this bike. 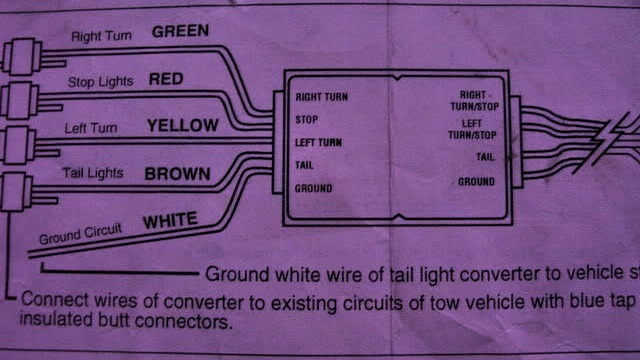 I tried a converter-to-use-turn-signals-as-brake lights – Hopkins #48845 – it works , but I did not like it. 1).. 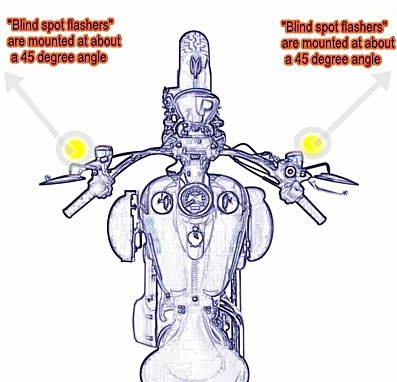 Turn signals were not in time with the bike’s other turn signals – might confuse other drivers. 2).. It made the turn signals not have a quick response like normal LED ‘s. 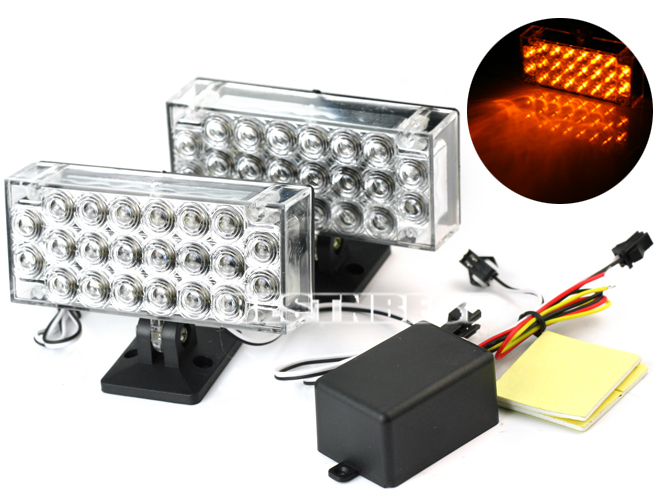 LED turn signals should jump out at you – the converter dulled their effect. I have six rear brake lights now – the brightest (safest) I have had on any bike. I removed the center stand – xv250’s lower frame cross brace is not strong enough to bolt a center stand to and after a year and a half mine was cracked on one side. I re-installed the side stand and cutoff switch – weight reduction of 3.2 lbs (4.75 lbs vs 1.5). The bike leaned too far so I needed to make the sidestand longer – I drilled a small hole in the foot of the sidestand and added a rubber piece. I think the perfect height of the rubber bumper that I added should have been between 1 and 1.125 inches – mine was less than that but at least it is better than it was. 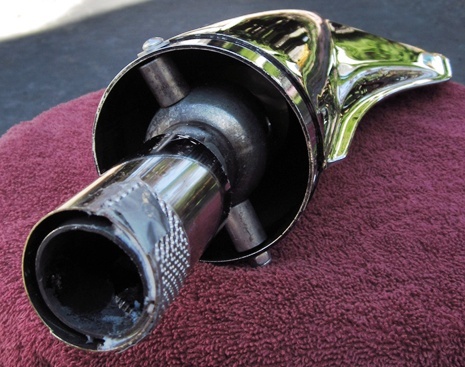 I removed the fishtail exhaust tip – 2 lbs weight reduction. My recent change from a 140 to 130 tire reduced the bike’s weight by 4 to 5 lbs. So I have taken 9 or 10 lbs off of the bike lately – headed in the right direction. A few days later, my one-month average is now 78.5 mpg. The same time period last year I got 82.8 mpg. It is good to have a second way to start your bike in case there is a problem with your electric starter or your battery. Did I ever tell you about the time I was at work with a dead battery and I push started my car on level ground by myself ? It was a four cylinder car and it started on the second try. I removed the Fishtail exhaust tip today. The tip and mounting adapter weighs 2.7 lbs (1.22 kg) and the Supertrapp end cap I put back on weighs 6.6 ounces (0.19 kg) – so my bike is over 2 pounds (1 kg) lighter now. For the first time, I have been thinking about trikes lately. 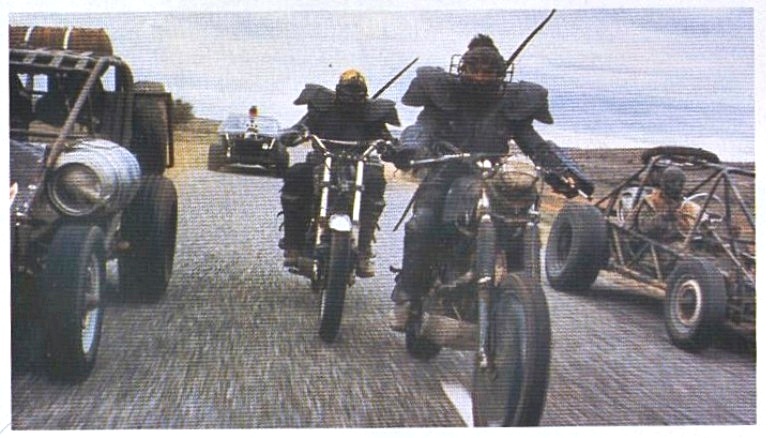 I always sort of figured they were safer than 2-wheel motorcycles, but when I was doing the research for this post http://wp.me/p1LWaM-Ai the light bulb come on. They really are safer – maybe a lot safer. After seeing how expensive they are, and riding my bike to work this week (I cannot imagine not leaning), I will not be getting a trike anytime soon, but as I get older, at some point I will consider it. 4) no fenders at first, then plastic ones later. Since the axle is aluminum, the finished XV250 trike would be somewhere around 75 lbs heavier than a stock Virago 250 – the stock rear wheel would be removed, and it is fairly heavy. But the trike axle and wheels would cost over $3,000 – my bike cost only $1,200. I did my first commute of the year this week. This was my first commute with the 130 rear tire so I now am at 17/40 (instead of 17/39 equivalent with the 140 tire). I was surprised that I could feel a big difference – I had to upshift sooner and the bike was revved higher on the highway at 65 to 70 mph – which it could do all day – but at 50 to 55 mph the bike sounded comfortable. At one point, I hit 77 mph indicated (72 actual) – the bike felt pretty solid at that speed. My old tire was somewhat scalloped – this is more common in bikes than I thought. With the almost new 130 tire, the tire noise above about 50 mph is mostly gone. I had hoped that I would notice a performance increase with the 130 tire, but so far I have not. After the long winter, maybe the bike will get stronger as I drive it more. It was 42° in the morning so I used the grip heaters. Last year I found three useful things to add to a bike – grip heaters ($5.39 shipped), thermometer ($3.59 shipped), and voltage meter ($3.45 shipped). I did not become a genius over the winter, but I am just thinking out loud here…………. When the 50 watt carb heaters switch on, the effect on the available voltage is a drop of 0.3 volts. it just means at this point in time it is pulling more voltage than is available. With a larger battery, you would probably get a higher reading. With a larger alternator, you would probably get a higher reading. With a better voltage regulator, you would probably get a higher reading. Dec 20, 2012 Have not ridden the bike since November 12. I always say that the way to become a better motorcycle driver is to ride it everyday. 5) Spare tire – I will have the Kenda tire on a separate wheel, so I now have a spare tire. If I have a flat, I can ask my wife to bring me the other wheel, and I can change it on the road. Flat tires are much more common on the rear tire than the front tire on motorcycles – so hopefully if I do get a flat, it will be the rear. I am pretty excited about the change to the 130 tire – the bike should be faster due to the 4.5 lbs less weight, 3% higher gear ratio, plus the weight is rotating weight. Things that rotate are the best items to reduce in weight. The weight on the outer edge of things that rotate are the most important, for example – reducing tire weight is more beneficial than reducing sprocket weight. For a little more performance and gas mileage – set valve clearance to a little over maximum. Nov 12, 2012 ● Rode the bike to work today – have not ridden it in 3 weeks (the storm, rain, cold, etc.). I like the exhaust – it sounds a little deeper than the Supertrapp did alone. The bike ran great – one big hill I normally do in fourth, the bike went up in 5th at 50 mph. My Virago 250 has 17/39 sprockets, the best torque is about 70 mph, so 50 mph is well below that. 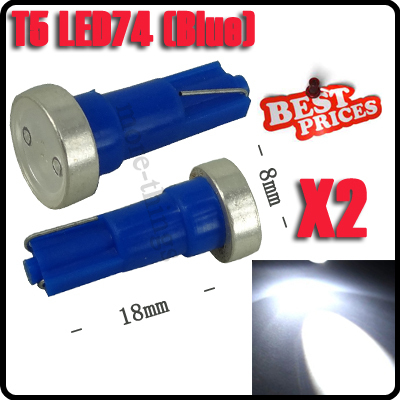 ● The blue T5 LED speedometer bulb was too dim to see in daylight or twilight – you can only really see it at night. I might put a one or two inch visor on the speedo to make it show it better. We had our power restored last night, so we had no power for over 4 days following the storm. I have not ridden the bike for about two weeks now – so I have not ridden it with the recent changes: fishtail exhaust tip, one 4 inch (102 mm) LED tail/brake light, and blue T5 LED speedometer bulb. The LED is not near as bright as the original bulb, but I think it will be fine at night. I got the 102 mm light from my other bike; it had two but I am going to to try just one for now – even though it looks out of balance. I thought it was too big for the Virago 250, but people have been tailgating me more lately; this 4 inch light is a serious tail/brake light, so it should help. Years ago, you would sometimes see bikes and cars with just one spotlight instead of a pair. I mounted the 4 inch LED to the right of the stock taillight with no space – more space between the two would make it look even more out of balance. Oct 24, 2012 ● I could not drive the bike to work again today. It was drizzling. I do not mind driving home at the end of the day in a light rain, but it is not a good idea to get wet when driving in to work. Driving a bike in the rain I have to be 100% focused – no daydreaming. I try to what the hypermilers do: “drive without brakes”. 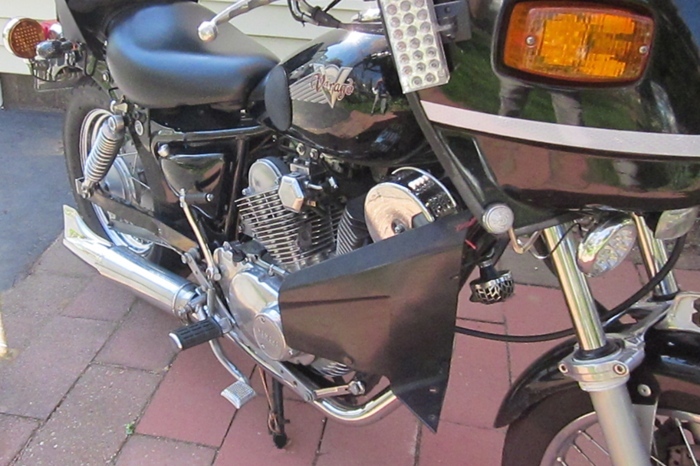 I just realized that the weak rear brake on the Virago 250 is actually a safety feature – I have never locked up the rear brake on the XV250, but on my other bike I have locked up the rear brake (and sliding/fishtailing)several times in emergency stops on I95. That is probably when I started saying that one of the most important ways to avoid collisions on a bike is to increase your following distance. 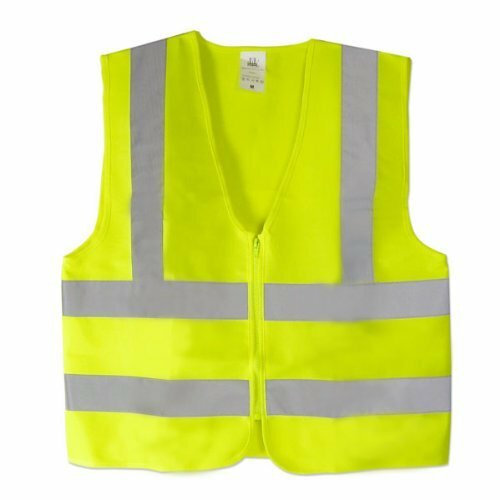 Increasing your following distance (and wearing a $7 reflective vest) is even more beneficial if you are an agressive driver. Oct 23, 2012 ● Yesterday I drove the bike to work but without the Fishtail exhaust tip, as the mount was still too loose. I just drove it with the Supertrapp muffler un-capped. I thought it sounded OK at home but actually driving it, it was way too loud. Last night I finished the fishtail exhaust mounting, but today it was going to rain so I couldn’t drive it to work. Oct 20, 2012 ● Took me six days to think of how to mount the fishtail exhaust tip. I like to make adapters and parts out of things that I already have instead of buying something. The two 3/4 inch long spacers came from the rear sprocket damper of the CB-160 I drove when I was 16. (Since I weigh a lot more than when I was 16, my Virago 250 is not much faster than my CB-160 was – only about 10% faster). Tomorrow I need to finish the installation. I need to tighten up the internal fit, and on the outside, add another bolt and two springs. The obvious joint between the fishtail tip and the Supertrapp muffler makes it not look as good as it should – which is too bad because the main attraction of fishtail exhausts is the looks – there is no performance increase. The sound is great, though – I think it sounds deeper than the Supertrapp alone did. 1) For a Virago 250, a 4 amp lithium battery is OK above 60° F, but struggles to start the bike around 55° and definitely won’t start it around 45° F.
2) Even in warm weather, a 4 amp lithium battery cranks a Virago 250 over slowly. If the bike is in good tune, it will crank right up. But if a Virago 250 is hard to crank, a 4 amp lithium battery would not be good choice. 3) On a Virago 250, a 4 amp lithium battery can power only one non-LED accessory at a time. For example, if you want to run grip heaters (on low), you need to turn the headlight “off”. Oct 18, 2012 ● My 4 amp Lithium would not start the bike in the morning (40°) but started it fine in the afternoon (58°). Also, the voltages were low in the morning but were fine in the afternoon. So I think that this might be normal for Lithium batteries, but before I figured this out, I charged the battery with a small (1 amp) charger for 90 minutes and damaged it – the battery has almost no output now. I took the battery apart and there was nothing I could do to get it going again. I am an experimenter and I find that I learn more when an experiment fails, so I normally am not bothered when this kind of thing happens (but I was a little disappointed). ● Because of the colder temps (35° F in the morning), my mileage has dropped lately – this week I got 80.7 mpg, and I was getting 85 to 86 a month ago. I recently switched to regular 87 octane, but I will put in B12 fuel system cleaner and also start using premium every 4th tank or so – today my bike sputtered/slowed down and required a switch to reserve at 86 miles instead of about 140 miles, so there must have been some trash in the tank. That has never happened before, and I was in heavy traffic on I-95. Most premium fuels have fuel system cleaners added. Oct 17, 2012 ● This morning it was 35°F or 1.7°C, so I did not try the electric starter – just push-started it. I had accidentally left my winter gloves at work, so I had to wear my summer gloves. The grip heaters were great. My bike does not have the juice to run them on “High”, but “Low” is good for above maybe 40° F – so the range for “Low” is about 40 to 55° F or about 4.4° C to 12.8° C. On “Low” the voltage guage was reading 13.4 volts, switching to “High” it dropped to 8.9 volts, a drop of 4.5 volts. Switching from “Off” to “Low”, the drop is only 0.6 volt. When it is this cold, the bike sounds “harder” and louder, so I kept thinking I was in the wrong gear, for example, I thought that I was in third when I was actually in fourth. Oct 16, 2012 ● Today I had to push-start my bike at home and at work and at the gas station, plus my voltage was running low. I did my 94 mile commute with my headlight “off”. ( I have 3 pairs of LED running lights in front.) Finally I figured out the on-off switch that came with it was actually a high/low switch – so when I thought it was “off” it was really on “low”. The grip heaters that I bought did not come with instructions. Tonight I added a switch – I did not have any proper switches, so I used one from an old coffee maker. Coming home it was 58 to 60° F and the heat on “low” was too much – about half of that heat would have been good. Below maybe 55° F, the “low” setting would probably be about right. Other than the low voltage issue, the wind was pretty strong today, and the bike felt great. Oct 13, 2012 ●Added some grip heaters ($5.39 shipped) today. Most grip heaters use 36 to 43 watts for the pair. Mine seem to use a lot more, but I will learn more as I use them. The Virago 250 has a simple charging system; the alternator puts out about 400 watts more than is needed and the voltage regulator gets rid of it (alternator makes about 600w and XV250 only needs about 200w). So there is plenty of watts available for the grip heaters, and I have a voltage guage so I will see if the volts are getting too low. Oct 10, 2012 ●Made an upper headlight brace out of the 9.5 mm (3/8 inch) aluminum tubing from an old fishing net. Before, my headlight was very jumpy and had the effect of a pulsating headlight. It feels a lot more solid now so I can’t wait to try it. A while back I lived in Kentucky for four years – I went fishing at least 5 or 6 times and I never caught a single fish – not even a small one. I would have won “worst fisherman” in Kentucky, but I never told anybody. 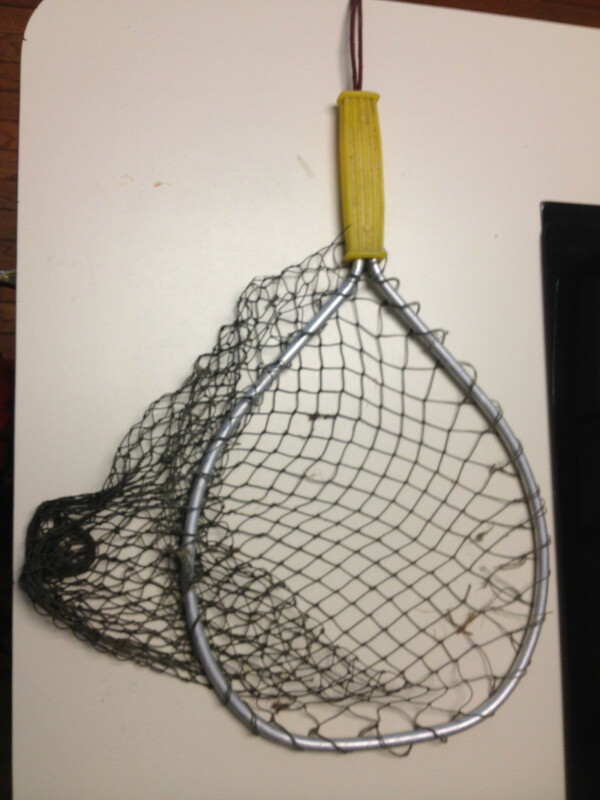 So that fish-net was never used until today. Oct 7, 2012 ●I have gone over 300 miles and tried different positions but I am still getting back pain from the lowered seat. Raised seat back up 2 inches. ●Put switch on tail-light and running lights so I can turn them off for easier cold weather starting. ●Connected neutral light to starter switch so neutral light is turned off when starter button is pressed – for easier cold weather starting. (edit 10/11/12 – Started on 3rd try this morning at 45° F. This is good that the little battery is starting the bike better, as I don’t ride motorcycles when it is much colder than this – below about 35° F) I think that is the nature of lithium batteries – to actually pick up power as you keep trying to crank it. ●I also checked the bike for battery drain when the key is “OFF” and there is none. 9/23/12 ●Lowered seat 2 inches down to stock position for better aerodynamics. (I have had seat raised up for a year and a half.) ●Fastened plastic to the front wheel to make a wheel disc for less wind drag. But driving to work the next day, the bike was being blown back and forth above 50 mph. I think the front fairing and light steering contributed to this happening. Wheel discs work fine on most bikes. I was on I-95 , and I got off after two exits and cut the plastic off. 9/16/12 ●Re-mounted lower fairings using rod from a old lawn fertilizer spreader and U-clamps instead of hose clamps. I added lower fairings to make the bike warmer in winter and it might help aerodynamics. Before I added the lower fairings, I was getting an updraft about 10 inches out from the bars – hopefully they will help. Mounting angles don’t match but that does not really matter – this way I can see if I prefer one over the other. At some point later I can make the mountings match. They make bike look a little like a sportbike – but already I am reminded that that is why I like bikes with no bodywork – they are easier to work on since plastic body panels are not in the way. I have a 2009 vstar250 and am really enjoying your posts and experiences, thanks for sharing. Very nice site. Thank you for sharing your experience. I recently, for the first time purchased a 2011 with 1100 miles. It is in mint condition and it rides great. Nooooo!!! I love this site. Sad to see you’re hanging up the spurs. Sean, Thanks! But I will still be riding the bike – just not driving it to work. My commute is dangerous, and my family needs me to not be in the hospital or the newspaper. The kickstarter is fake. It is not connected to anything. I found fully synthetic oil allowed my engine to start in cold weather since fully synthetic oil (not a blend with regular petroleum oil) doesn’t change viscosity with temperature. Caution: Make sure the can states that the oil can be used for WET CLUTCH.